Happy Tuesday! I am still continuing with making ingredients for my Sri Lankan Christmas Cake. My mother said I needed Golden Syrup so I looked online to see how much it would cost. A small can was $7 dollars on Amazon. So I googled if I could make it at home. That's when I found a YouTube video from Todd's Kitchen that showed me the exact process. Now the recipe he gave was in metric so I did my best to convert it over to US measurements. 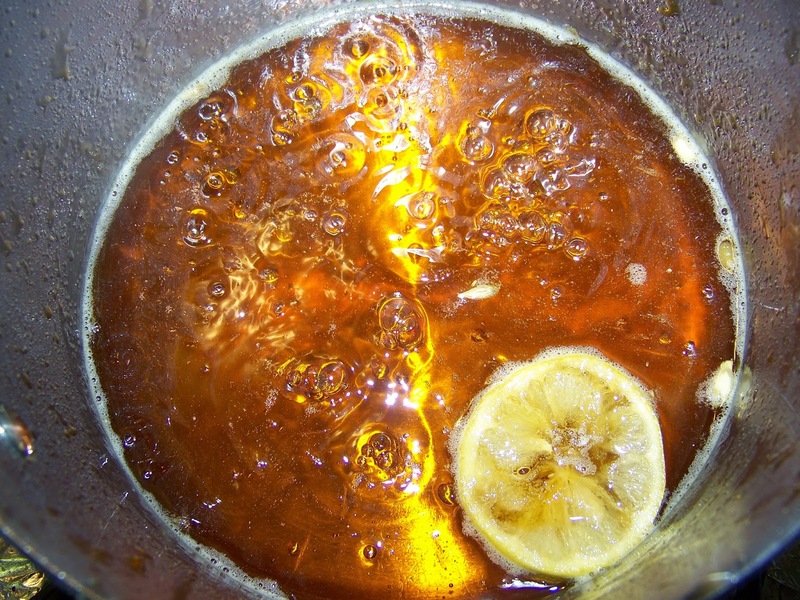 The recipe I am providing today is based on the final US measurements I ended up using to make my Golden Syrup. 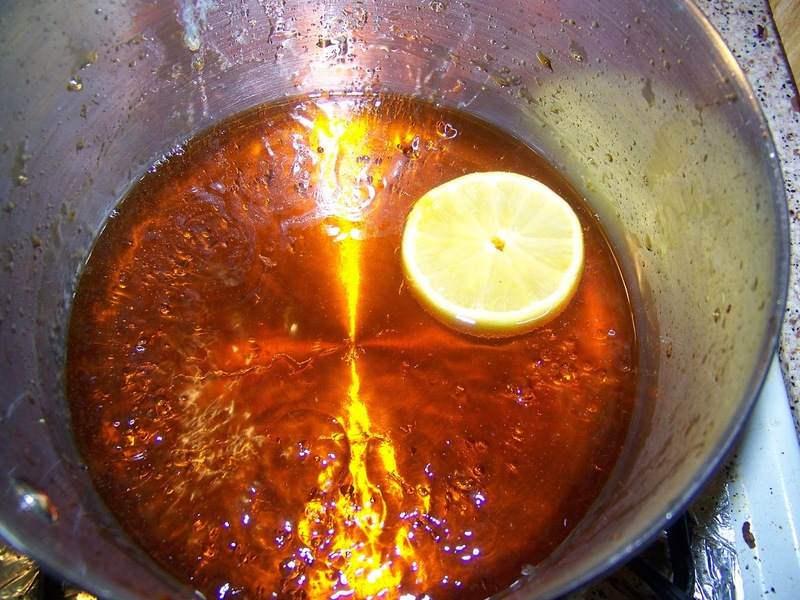 Now some of you may be asking, what is Golden Syrup? I have tried treacle because it's used a lot in Sri Lanka, but was not sure about Golden Syrup either. Well, now that I've had it and tasted it (a lot) it's almost a honey like thick amber colored syrup. It's taste quite rich and delicious and is even great simply on some plain Greek Yogurt or on pancakes. It was so easy to make as well. Yes, it did take some time and patience, but there is really nothing hard about it. Now I must say I did make a mistake my first try at making the syrup. I did not have all my ingredients per-measured and ready before starting the process. Big No-No! My syrup went from amber to dark in seconds and I ended up with a very dark syrup. I thought I had ruined it until I tasted it. Eureka! I had made a syrup very close to my beloved treacle. So nothing was wasted. I still had to get the Golden Syrup my mother needed for the Christmas Cake so I tried it again the next day. The only cost to make this recipe is sugar and a slice of lemon so it was worth a second try for sure. My second time around I prepared and measured all my ingredients ahead of time. You need to add boiling water which was my big downfall from the first time around so make sure to have that ready as well. Once the sugar starts to turn light brown it goes to caramel then to deep caramel very quickly, then to burned. This is the critical stage because if you want that lovely golden color you need to be totally watching like a hawk at this point. So for my second attempt I had everything lined up and ready to go. The end result was fantastic! Now I can make both Golden Syrup and a Treacle fake-out at home for pennies. Thank you Todd's Kitchen for your very useful and delicious recipe/method!! Note: Method and recipe based on Todd's Kitchen. When you get the right color add the boiling water (add it slowly because it will splatter). Then add the lemon slice (this stops the sugar from continue to caramelize) and the remaining sugar. Stir well until the sugar dissolves. Then place it on a medium low or low heat and allow to simmer gently for 45 minutes exactly. Note: I set it on medium low on my stove because low did not provide a gentle simmer, but you need to see a gentle simmer so what ever setting on the stove that provides that will work. I did not stir during the simmering stage. I just check on the process from time to time to make sure it stayed at a gentle simmer. Once the 45 minutes is up (I used the timer on my stove), turn the stove off and let the syrup cool down for a while in the pot. 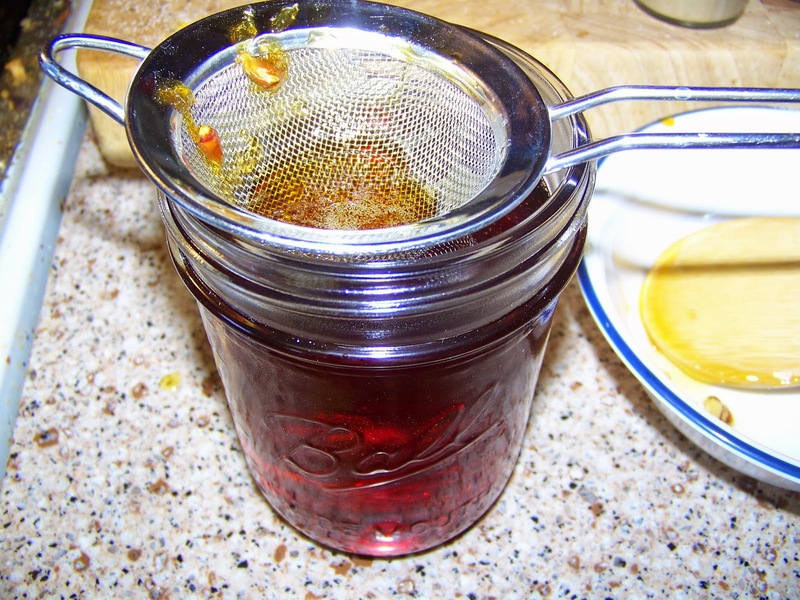 Then strain syrup into a sterilized jar or bottle and allow it to cool completely before you seal the jar. Allow the syrup to set for a day so it can thicken more before you serve. Enjoy. 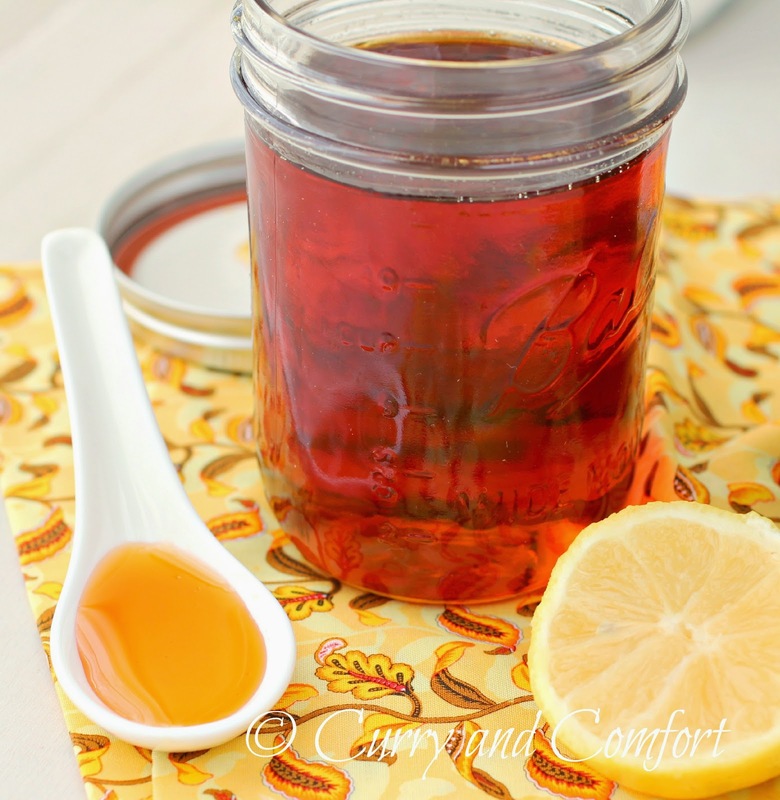 Note: You can store this syrup in a cool dry place for a month or more. Note: Here is a photo of my "Treacle" syrup. 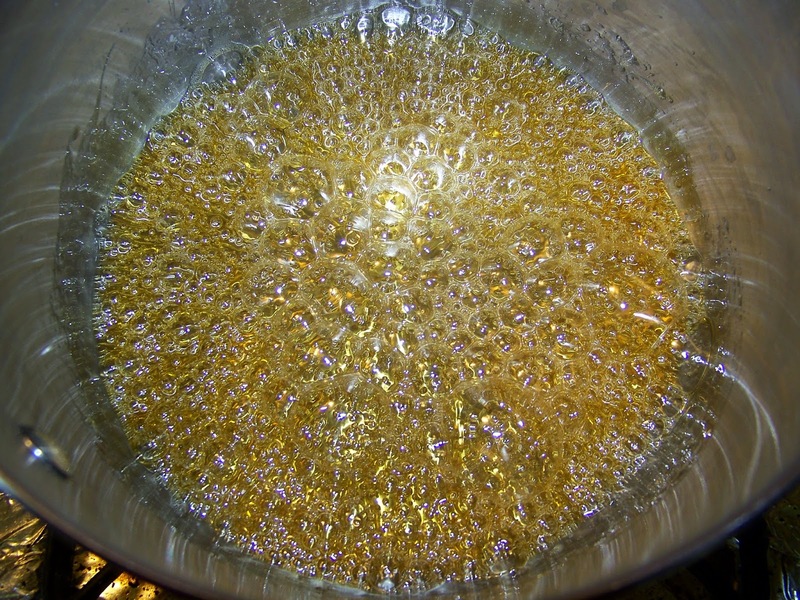 I allowed the sugar to caramelize too much before adding the boiling water. One of the local grocery stores sells Lyle's Golden Syrup, but it is quite expensive. So, last year I looked on-line and found a place from which to order it that was less expensive than the grocery store. I ordered a box of six bottles and when they arrived, one of the bottles was cracked and had leaked the syrup all over the inside of the box. The syrup had also made a puddle on my front porch where it had leaked out of the box--kind of messy to have to clean up in the winter time when I couldn't just take out the hose and rinse off the porch. Anyway, we called the company and requested a replacement bottle. The people were really nice and to our surprise they sent another SIX bottles instead of just the one replacement bottle! I love the idea of saving money AND learning how to make a specialty ingredient at home! 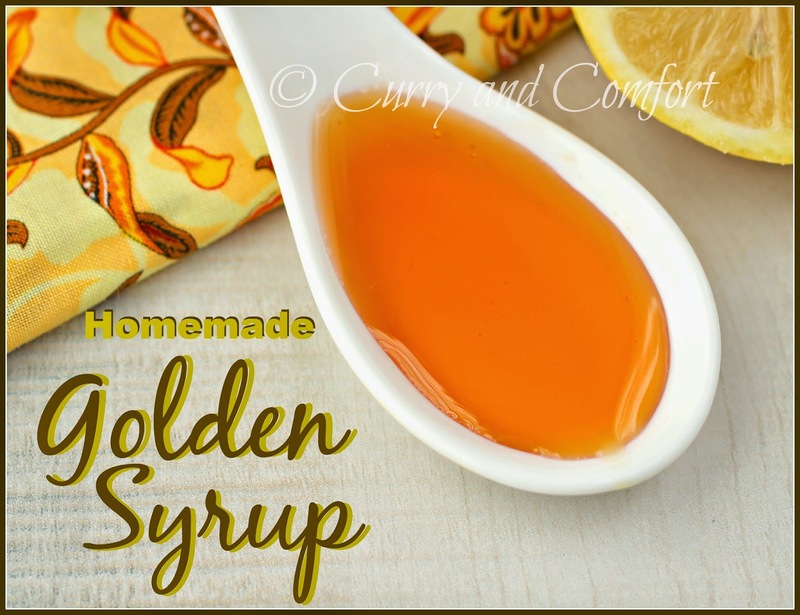 This golden syrup looks lovely, Ramona! The color is beautiful and having it on pancakes or French toast would be very tasty. What a great idea!! We use a lot of syrup on pancakes, crepes, waffles and biscuits. I needed these recipes! Thanks! I have never heard of Golden Syrup until I made my own Granola and the recipe called for Golden Syrup. I ended up using real maple syrup because that is what I had on hand and because maple syrup seemed more healthy as apposed to all that white sugar. I would like to know if I can use brown sugar as a substitute for white sugar? 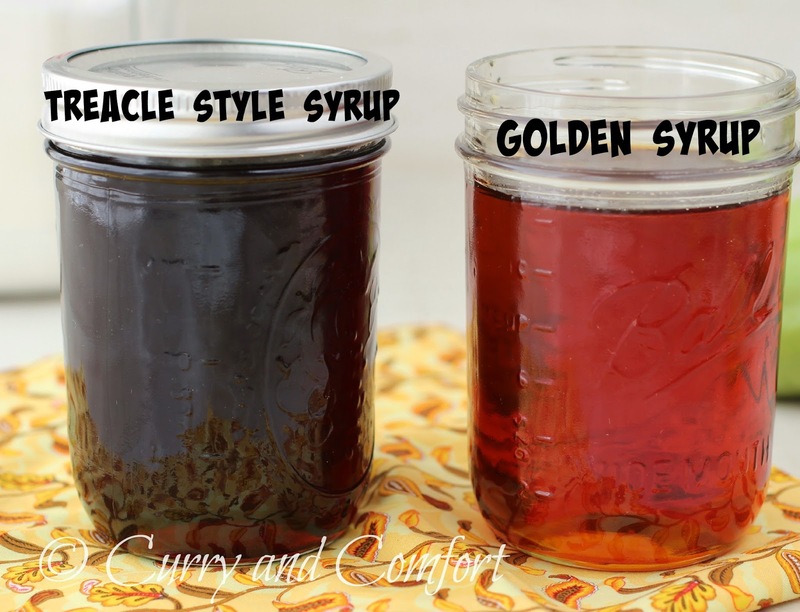 Also could I use maple extract for flavoring to the Golden Syrup? The problem is, due to the lemon, it does NOT taste like Golden Syrup. It has a lemony flavor. It isn't a matter of time that determines when you are done cooking, it is a matter of temperature. I had read 230 to 240 degrees F. For my stove, 45 min. was not enough time and I had to reheat it. Used a thermometer and stopped it at 235, which produced the right consistency. However, the flavor is WRONG. Be SURE to use something other than a hunk of lemon in this! Yep. I'm British and this doesn't taste anything like Lyle's Golden Syrup. Nice, but definitely not Golden Syrup. Oh and you don't make treacle by burning the sugar :) Treacle is actually the liquid left over after sugar is refined. It is then refined again to eventually become black treacle. I tried making this too...way to much lemon flavour for my liking. I was hoping the get the Lyles taste too. No where near it. Actually disappointed with it. Tried it a couple of times on toast. Yuk. this has made my pecan pie at hit. In the past I have used agave nectar. It is good but not as sweet, but good. i have looked everywhere for the answer and cant seem to find it. why does the syrup get alittle too thick? did i cook it too long or not long enough? why am i having to cook for 45 minutes exactly? I was reading recently that you can also make condensed milk at home. So there are now two new things for me to try. Thanks for the inspiration. The color is beautiful and having it on pancakes, French toast or on Breads of your style would be very tasty. After 3 tries, I finally gave up on this. I tried stirring in the first step (since your directions did not specify whether or not to stir at this point), and then I dumped that out and tried again, this time NOT stirring during the first phase. On both tries I never got to the 2nd phase, because each time I ended up with crystalized sugar. 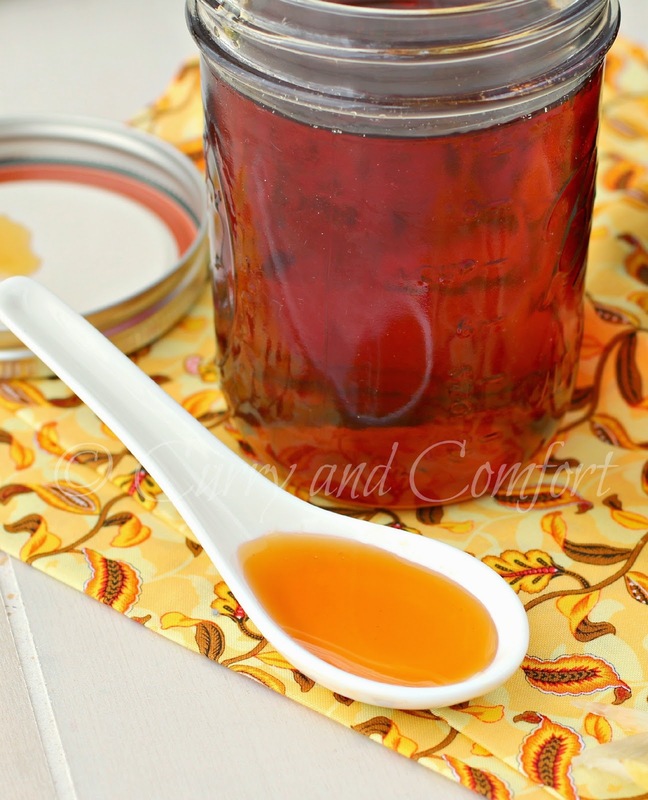 The water in the pan quickly cooked out before anything close to a caramel color happened. Then, I went on to over to Todd's Kitchen and watched his YouTube tutorial. Even though you state that your recipe is based on his, his methods are different entirely. I tried his also. Followed the directions to the "t". Still no caramel and still just ended up with hard sugar crystals. I watched it constantly all three times, and kept the heat where the directions instructed me to each time. I cannot figure out what the secret to this magic syrup is. I am a good cook and an experienced sugar artist, yet I could not get this to work for me. It's a good thing sugar is not all that expensive, because three tries could have been costly otherwise. The same thing happened to me. I was hoping to find an answer to that problem. I guess I'll have to check back later. Try making a double batch... or use a smaller pan. i had the same problem the first time i made it. Doubled the recipe and it worked wonderfully. You do need to stir the mixture in the first stage till all the sugar dissolves, then leave it to caramelize but watch it closely... once it starts turning colour it goes very quickly. My first attempt crystallised as well. 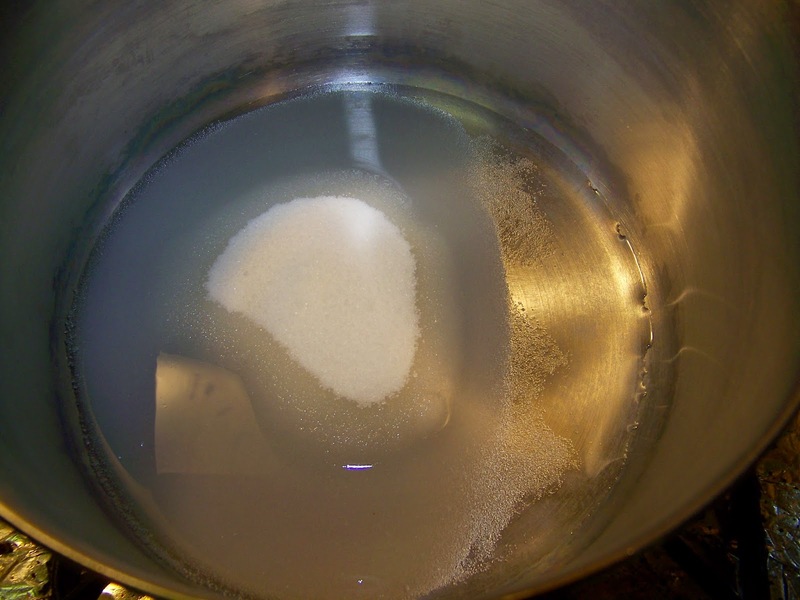 On my secret nd attempt, I fully dissolved the sugar in water first (to almost clear mixture, no sugar crystals) before putting the pot in the heating stove. Then left it till mixture turns brown, no stirring. Second attempt was a success. Could I use Citric acid in place of a lemon slice? If so, what would be the recommended amount?